Well, Cate wasn’t exactly impressed with Santa. In fact, she wanted nothing to do him. So it didn’t quite go like last year. There are more pictures on Facebook from our Friday night fun at a local outdoor Christmas event + live nativity that was thankfully inside. 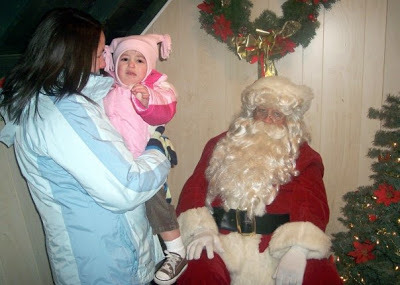 I think she was fairly adamant that she did NOT want to see Santa.